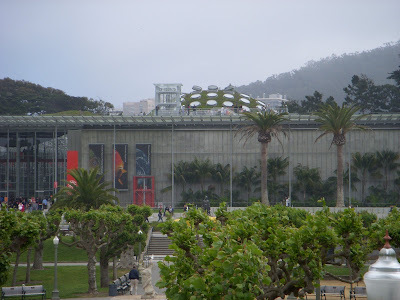 In this photograph you can just see the living roof on top of the California Academy of Sciences in San Francisco, California. We visited over Memorial Day Weekend and had a fantastic time exploring what felt like the entire globe. If you have a a minute, here is a short clip of our experience. There are tons of inspiring places over at Photo Friday today, I hope you head over there to take a peek! Photo Friday - Dominical Beach - The True Surf Town and So Much More! what fun! we LOVE aquariums. thanks for sharing this one! Living Roof? Wow! That's a great concept. I am dreaming of going back to SF frequently. I have many fun memories of the Academy of Sciences growing up. Can't wait to see the transformation! We went in the first weeks after it opened...talk about long lines! But so worth it. I especially love the living roof. You are lucky to live in such an amazing city. We enjoy visiting my husband's family a couple of times a year...always so many interesting and fun spots to visit. You have inspired me to try braving this daytrip this summer. I LOVED the video. What a great song to choose to go with it too! You have such a great knack for editing your movies. I enjoyed every moment of it :). That place looks really popular with kids, no doubt! Great video...and I enjoyed the peek at the living roof in your photo. The Academy is fun. Did you catch the 3D bug show and planetarium show? Those are the first things we grab when we get in because the passes disappear FAST! Hi guys - thanks for the great comments. No, unfortunately the lines were too long for the planetarium or 3D shows...I figured it was all so great, that gives me a reason to go back again!